On Sunday, September 13, I ran the Surftown Half Marathon in Westerly, RI. It was the second half I've run. When I first mentioned it to My Musician I wasn't sure he'd be keen on traveling for a half marathon, at least not 5 hours away. But I had barely said the words "It's by the ocean" and he was telling me to register. We decided to splurge a little and get a hotel right on the beach and to take a couple days to enjoy it and have a mini vacation. Right from the moment I registered, this has been a goal race for me. I wanted to run it in under 2 hours. I was sure I could till two weeks before the race. I really struggled for almost 2 weeks with physically and mentally rough runs. My pace was way slower than I wanted it to be, my legs felt sluggish and heavy, the temperatures were higher then they'd been all summer and my mind, oh my mind wouldn't stop torturing me with all the negatives it could conjure up. I wasn't even sure I was going to beat my PR. My May half marathon time was 2:24:33. I had a terrible run with My Musician on Tuesday (even he couldn't believe how slow I was going) and I couldn't keep the pace my schedule called for on Wednesday and even cut the run short. 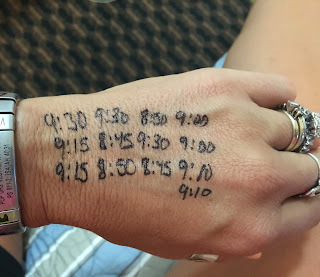 I felt really discouraged at the thought of racing on Sunday. 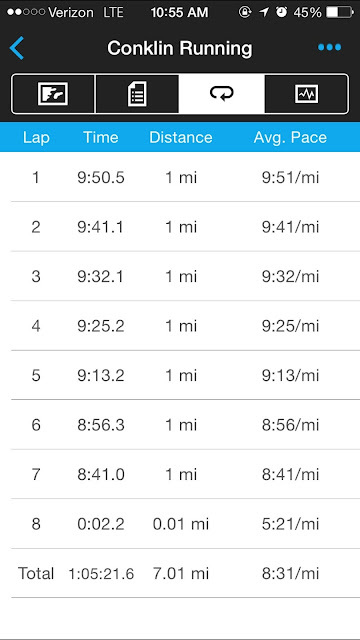 It was a fantastic run of negative splits. I felt strong, the temps were cooler, each mile just melted away. It gave me the confidence I needed heading into this weekend. As I packed my flatties, running gear and family up for our 5 hour drive on Friday morning, I felt, for the 1st time in awhile, really excited for this race. The drive there was nice and uneventful. The only part that caused me minor stress was the bridge over the Hudson River. We were moving at about 20 mph and it's one long, really high up bridge. I don't like bridges so this caused some anxiety. I snapped one pretty crappy pic but the view was beautiful. Now I'd love to run across this bridge and get better pictures. Yes, I can run or walk across bridges with no anxiety at all, I just can't handle being in a car. Then we drove past where a phone friend works. It was fun and unexpected, getting a peek into her stomping grounds. When we got to the Inn I was thrilled at how close to the ocean we were. I'll get it out of the way now, the rooms were ok but the beds were horrific. My Musician ended up on the floor, on my yoga mat, sometime in the middle of night, just to try to find relief from the pain the bed created. We couldn't wait to get back home and get an appointment with our chiropractor. Thankfully the beds, and sore backs, didn't put a damper on the weekend. As you can tell from this panoramic picture, we really suffered being on the ocean. More about our vacation after the race report. 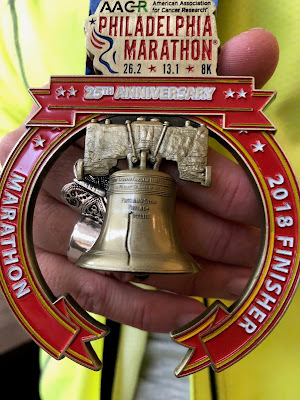 There were many aspects of this race that was exciting to me, getting to meet some Sub-30 Club members, racing by the ocean, which I've not done since Big Sur, and hopefully setting a new half marathon PR. I was pretty nervous on Saturday night. 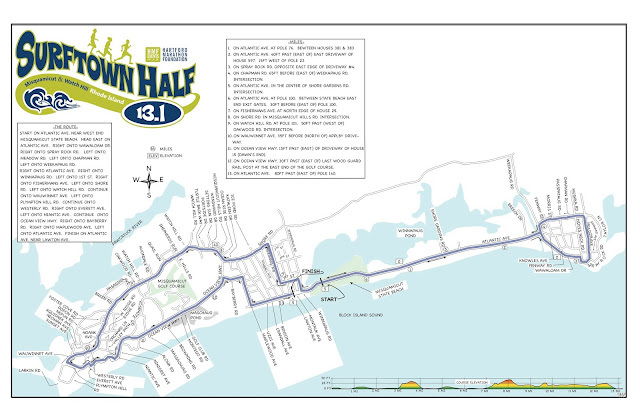 I've only run one so I really wasn't sure how to race a half. I knew I needed to run around 9 minute miles to reach my goal. That's not a pace I've run for a longer distance in a couple months. Finally My Musician suggested I sit with him and go over the race course and come up with a strategy on how to tackle each mile. The course is pretty flat but there are a couple of small hills that we wanted to address. I knew what I had to run every single mile to run the perfect race with perfect splits. I also knew it was not going to happen. I rarely run splits that are the same. So we sat down with the elevation profile, map of the race and a site I like that adds the times I enter to give you an overall time. We figured out the few miles I could run slower and recover a bit and the miles that I had to run faster to make up the time. After pulling my hamstring 5 years ago running downhill, I've been afraid to run fast downhill. This summer I've learned to run fast and safe downhill so I knew I would use that to make up some time. After writing down those times, I also wrote down the times I needed to hit miles 3, 6, 9 & 12, just because I like to have my checkpoints. Of course, I didn't stick to any of this. I woke up, after a rough night on those beds, actually feeling refreshed and excited. I'm getting into a pretty good pre-race/pre-long run routine in the morning with my food. I had the bar I always eat, 2 hours before the race with my coffee and then I had my smoothie about an hour before while I was getting all my gear on. Couldn't decide what shirt till that morning. About 7 am, I headed out the door for a quick mile warm up and leg stretches. Then I met My Musician and Tink at the start line area. Our hotel was less than a quarter mile from the start line so it was really convenient for us. The lines at the porta potty was crazy. I probably should have just run back to our room to go but no, I got in line. I have like a minute to spare and I squeezed in at the start line. I forget how many were registered but the starting line was packed. They made announcement about water in the roads, the really bumpy areas to watch out for so we don't trip and they played the National Anthem. There's the gun and we're off!! It was literally a walk to the start line. The crowd was so thick, it took me at least 30 seconds or more to get to the start line. There's My Musician and Tink, always just past the starting line, to send me off into my race. I love having them there! Mile 1 ~ I felt like I was crawling but every time I looked down I was in the 8's. I felt great. The weather was cooler, the sun was hiding and the breeze wasn't too bad yet. I heard some people complaining about the humidity but I've been running in 90+ % humidity all summer so I didn't notice it. Somewhere in mile one, Professor Badass (see her blog here) caught up and passed me. I planned to keep her in my sights but I lost her somewhere in between mile 3-4. Mile one was interesting, too because as the group spread out and thinned out, I was able to observe a lot of different runners. I had a biomechanical evaluation done of my running. It's not about gate as much it was to evaluate my efficiency while running and My Musician had his gate recently evaluated. So between those two things, I tend to watch other runners more to see what their movements are. For me, I move my hips too much and spend too much time with my foot landing, pushing off instead of pulling myself forward. I've been give specialized exercises to help correct that. My Musicians gate looks very painful when I watch him, but he's broken his back twice and has spondylosis and has learned how to hold himself to minimize his pain. So I was watching other runners while running. One girl ran with her feet crossing each other so intensely that I was afraid she's trip herself, another was running with both arms straight down to her sides and yet another was carrying everything in her hands so she was almost hugging her fuel and fluid to herself. I always find it interesting how such a simple sport as running can have such diversity in every area, from training plans to fueling options to what to wear to running styles. Well, now that I've gone off on quite the butterfly path....back to the race report. Miles 2 - 5 ~ I ran with another woman who was running her 1st half. She was hoping for a sub 2 hr also so we decided to run together for as long as we could. I was still way ahead of my pace. Miles 3-4 is a gorgeous private neighborhood that we had visited the day before. The coast is rocky. Just the type of coast I love and imagine when I someone says New England Beach. The houses are gorgeous but the road was scary. I have a real talent of tripping over air so running on roads that are left intentionally bumpy to keep tourist driving slow was a bit nerve wracking for me. Thankfully I got through that area just fine and ahead of time. The hilly area in this part of the course really was nothing compare to what I have to run at home. Mile 6 ~ I hit my mile 6 mark almost a full minute ahead of where I was planning on being. I was thrilled to know I had a little breathing room incase I got tired in the end miles. The sun peeked out during this mile. I live and breathe for the sun but when I'm running, I like it to stay tucked behind a thick cloud cover. Thankfully it only came out for about a minute or two. I also lost my running buddy this mile. She was doing great but losing steam. I made sure she was ok and kept running. She ended up running a great race, around 2:09 I believe. Mile 6.5 ~ There is an electronic check point. 58:39 according to my watch (which I start as I cross the start line) I was thrilled with my time so far. I did a sort of system check of myself. I felt good, really strong, my breathing wasn't labored, I could talk while running, and my legs weren't feeling tired yet. Mile 6.7 ~ There's my hubs and Tink, cheering and whistling for me. I love the boost I get from them. Mile 7 ~ This is where the race turns inland, away from the ocean. It's a bit quieter, less spectators and we go down to single lane to share the road with traffic. Also, from about 6.7 - 8 miles is a slow steady incline. Not much of one but enough that you are feeling the effort compared to the last 6 pretty flat miles. Mile 8 ~ This was my slowest mile at 9:18. I felt a bit tired but I was still running strong and consistently passing runners. I love that part. Picking someone ahead of me and working my way past them. I remember at one point being surprised at how many I had passed already. Mile 9 ~ was pretty uneventful. I knew it was almost time to fuel. I felt really good and had saved my Huma Cafe Mocha x2 caffeine specifically for this last fueling so I'd have that extra energy burst through the last 3 miles. Mile 10 ~ Time to fuel. When I was running 5 years ago I was using gel blocs. I can't chew, breathe and run so I liked the concept of the gels. I like how the Huma make me feel compared to the GU but the texture still doesn't sit well with me. I've learned to squirt some in my mouth and follow with water immediately to just wash it down. As I started the slight downhill of mile 10 into the little port town of Watch Hill, I opened my gel, squirted it into my mouth and immediately thought, "Sh*t!!! That was way too much at once." I tried to get water in to wash it down but it was all too much. The only thing I could do was lean forward and let it all fall out of my mouth. I was chocking on the water I'd tried to get in and frustrated that out of the little 1.3 oz container, I'd probably just squirted an ounce in my mouth. I couldn't let my pace suffer but as I wanted to do was stop and try to catch my breathe. I was coughing so hard the runner up ahead of me, turned around to see if I was ok. "Yeah buddy, I'm all good, just major ego damage done here and I choke to death in beautiful Rhode Island" I just gave him the thumbs up and kept trying trying to clear the tiny bit of water that was stuck in my throat. The next thing mile 10 had in store for me was a hill that reminded me of the hill I do repeats on at home. Part of me wanted to just walk it with everyone else who was walking it. There was no way I could do that though and I dug in and ran it with the same intensity that I would run a hill repeat. I was sucking wind at the top but it was great downhill after to recover on. It had turned out to be a good mile even with the hill and choking at a 9:05 pace. Miles 11-12 ~ They are a painful blur. Painful meaning I was tired but refused to let up on my pace. I just wanted to walk. I had my typical moment of, "Screw this, I'm never racing again." There was no laughing, joking or even chatting among the runners anymore. Everyone was just concentrating on finishing this race. Mile 13 ~ I was so relieved to see that sign. As we turned onto Atlantic Ave, I knew, from my warm up run, there was about a half mile left. But it seemed like the longest and hardest mile of the whole race. I ran it in 8:39, which really shocked me. I felt like I was running in slow motion. I looked at my watch but the sweat was burning my eyes and I couldn't see my time. I didn't realize I'd caught up with and was passing, one of the pacers and he yelled at me, "The time for looking at your watch is over, just run." It cracked me up and pissed me off at the same time. It was the kick I needed to just push to the end. When I finally could see the clock (I think I need new contacts!) it said 1:59 something. I was freaking out even though I knew it was gun time because I didn't want to miss my goal by seconds. I knew My Musician would be so disappointed too, if I missed my goal by seconds and I didn't want him to be. I know he's proud of me no matter what I run but I also know he takes my goals very personally, for me, and would have been upset for me (not with me) if I didn't make it. Yep, it hurt but was a ton of fun too. 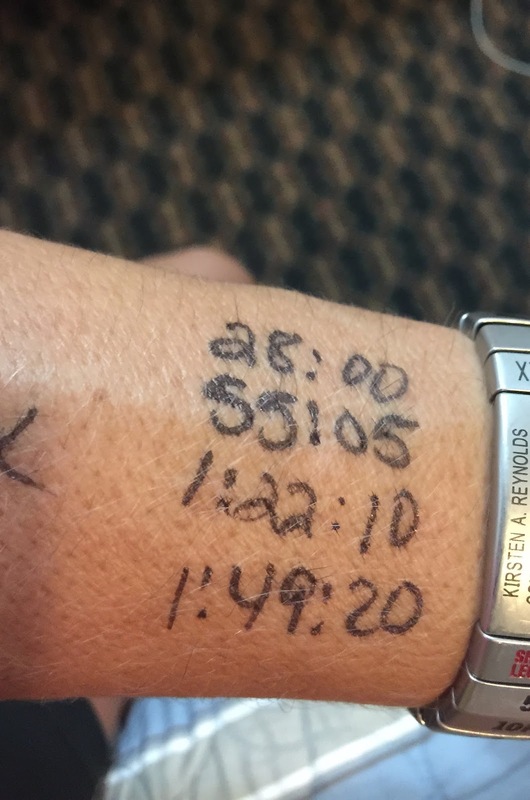 1:59:10 was my net time. I was thrilled. I felt good, tired but not totally spent. If I had more experience with halves, I might have left more of me out there but I was really happy with my time and how I felt after. I beat my previous half marathon time by 25:23!! That, I couldn't be happier with. PLUS as I was crossing the finish line, there stood Professor Badass. It was really fun to see another Subber there. These are the sand dunes at Misquamicut Beach State Park where the start line is. After the race a group of us met for a celebration brunch. The restaurant was small so we were all separated but we had chances to chat. I went over the race with My Musician while we ate and then chatted with a few of my phone friends that I finally got to meet. I'll get to see these women at a couple upcoming races this fall, which I'm really looking forward to. They are wonderful women that I've loved getting to know. Prof Badass. Thanks for being such a great inspiration and support in all things running!! All four of us are members the Sub 30 Club on FB. Meet-ups are a big part of the group. After breakfast, we did some shopping in Watch Hill, played on the beach, got beat up some more by the waves and in general just chilled and enjoyed the ocean. Then we went out to dinner to celebrate. It was a beautiful area and I am hoping to run this race again next year. The town was really quiet because the tourist season is over so it added to the small New England beach town feel. she would've had mac n cheese instead!! The weather was windy and a little chilly. I say chilly but it probably wasn't. I'm cold once it hits 80 or lower. Saturday was great. It was clear, warm and very sunny. I got a little too much sun but hubs, Tink and I spent a lot of the day in the ocean. We got knocked around quite a bit by the waves. It was so nice to just relax by the ocean and do nothing. Of course she thinks she commands the oceans! I have a million pictures of them in the waves this weekend. They had so much fun. Tink would have spent the entire day in them. I NEVER go out this deep in the ocean. NEVER. But we were having a ton of fun with the waves. We've been the beach many times and each time is just as special! And then it was time for the long drive home. I missed the ocean the second we turned our car West. What a fantastic post! I loved meeting you and having brunch with you. You had such good race. Congrats again on the amazing PR! Thank you. I loved meeting you too! Thanks for organizing the brunch for us all! I can't wait to see you again in November! !